Hey guys, I have a new computer again so my post should be better now. Ive been struggling to find time to post and have a computer there too. 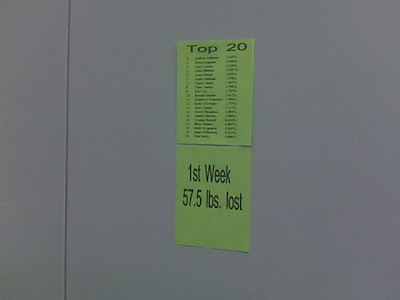 Any way congrats to my workout buddies and I we were all in the top 10 in the new weight loss contest. Number 3, 6, and 8. Yeah, I was number 6. Yes I know you cannot read the names I did that on purpose for other peoples sake. If you look close you can see my name at number 6. Woooo Hooooo!!! I had such a great workout, I cannot believe how crazy it was. I did my weight and my legs were so weak after I was finished with them they were shaking. Then I did arms and they were not as bad as legs but they are definitely fatigued. Good rest tonight will help me with any soreness. I am a little sore from yesterday, I used an axe to try to get a stump out of the ground at my sisters house, so my back and arms were a little sore from that and then a workout on top didn't help anything. One of my weight loss buddies is taking it easy this week she is having some pain in her knees, but she still went today just took it easy.